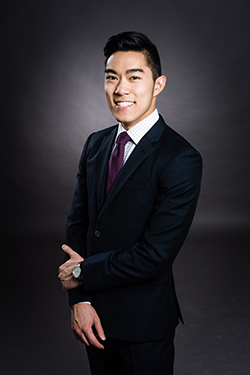 While this spring may represent the end of an era for senior Brian Cheung, the experiences that he has had through Syracuse University have prepared him to be a highly successful professional. Cheung is a dual major in Whitman and Newhouse, studying finance and broadcast and digital journalism, with a minor in Chinese studies. The Rockaway, N.J., native has earned a 3.8 GPA, along with numerous awards and scholarships, and aspires to be a financial journalist. He’s spent three summers interning for NBC, as well as with the Global Institute for Tomorrow in Hong Kong during his semester abroad. You’ve received high praise and recognition throughout your time at Syracuse. Can you go into more detail about some of the awards you’ve received, and what they meant? Most recently, I was selected as one of 11 seniors to be named a Whitman Scholar, which is the highest academic recognition awarded by the school. I was incredibly honored by the opportunity, and really by all of the opportunities offered to me throughout the years. The way I look at it, if someone’s going to stick his or her neck out and nominate me, I have an obligation to follow through and put forth my best portfolio. I always try to position myself in a positive way, but there are a ton of smart, capable students out there, so when a professor singles me out, I owe it to them to try my hardest. I’ve also been named an Emma Bowen Scholar, which is a program that aims to increase the presence of students with minority backgrounds in the media, and I was awarded the Thomas Mulaney Scholarship by the New York Financial Writers’ Association, in recognition of my financial writing and interest in financial journalism. Here at SU, I’ve been a consistent Dean’s List student and a Renee Crown University Honors Program student. You have a big interest in finance journalism. When did that start, and what first sparked your interest? I came to Syracuse wanting to study journalism. After applying to Newhouse, and then getting in, I couldn’t see myself going anywhere else. My parents were very supportive of my journalism ambitions, but they also urged me to make the most of my time and go for a second degree. I’ve always had a general respect for the finance field, so I figured, “Why not?” But as I got deeper and deeper into the coursework, I started to really love the idea of stock trading, with all of its ups and downs, and really just the overall exciting nature of risk. In particular, I really like the concept of money and currencies, of the world economy and currency exchange and how it all works together. It was that interest that led me to go abroad to Hong Kong my junior year, and while overseas, I came to the ultimate realization that my two interests could be blended together. Finance journalism was the way to go. While abroad in Hong Kong, what memorable experiences did you have, and how have those experiences helped you back in the United States, with both your academic and professional careers? Going abroad to Hong Kong really showed me just how many different cultures and worlds there are out there. I visited nine different countries, and to see that corner of the world and be exposed to so many different things was very cool on both a finance and journalism level; it shows how many stories there really are to be told. With today’s globalization, Americans should know what’s going on in Japan’s and Malaysia’s economies more than ever before, and maybe I can be the guy to do that. When it comes to your professional career, where have you interned, and what are some of the most valuable lessons that you’ve learned from your work experience? Through my Emma Bowen Scholarship, I’ve had the opportunity to work at NBC for the past three summers. I was in a rotational program, so I first worked in advertising, then investigative journalism and finally breaking news. Also, while abroad in Hong Kong, I had a marketing internship in an economic think tank called the Global Institute for Tomorrow. This semester, I’m returning from a four-week, holiday break internship at CNBC. Through everything, the most valuable thing that I learned is that in order to be successful, you must be willing to learn. I learned a lot in the classroom, but once you’re out in the real world, things change. You need to rely on your coworkers and yourself, and constantly adapt. Every summer at NBC was a totally new experience, and I had to listen to my supervisors and just absorb as much possible. If I wasn’t willing to learn, I wouldn’t be anywhere near as successful. I try to be as diligent and hardworking as possible, and it’s really paid off for me.